Speedtwister, the trochoidal high-performance milling cutter for the highest demands. New for 2016, Fenn is proud to launch the all-new Maykestag ‘Speedtwister’. Especially developed for Speed Trochoidal Cutting, the Speedtwister is suitable for conventional and dynamic milling strategies. With huge cutting depths of up to 5xD, high tech coating technology and optimised tool geometry for perfect chip control, the Speedtwister provides increased productivity and profitability. With the advances in CAD CAM software and improved machining strategies, alongside the continuous concern among manufacturers to reduce cycle times and tool wear while maximising productivity, Maykestag set about developing a new product range in close cooperation with customers; thus emerged the Speedtwister. A high-speed machining product specifically tailored and individually made for customer production processes. Through innovative technology Maykestag offers new standards in trochoidal machining to optimise the metal cutting process, resulting in significantly increased customer productivity and profitability. Capable of high-speed machining the Speedtwister produces a light, rapid cutting action resulting in increased metal removal rates and accuracy with long-term benefits. Featuring cutting lengths of 3xD and 5xD, users can effectively use the full flute length, executing a full depth of cut with an additional percentage step over on the radial cut, saving both time and money while also reducing machine load. Suitable for both rouging and finishing and offering a Universal and Inox range in both 3xd and 5xD the Speedtwister is suitable for general steels up to approx. 50 HRC as well as stainless steels, Inconel and titanium, among others. 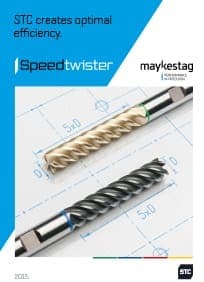 Further information on the Speedtwister range can be found at www.maykestag.com/en Alternatively customers can contact Fenn on 01376 347566 or sales@fenntool.com to arrange a visit with a technical engineer to find out more.